Located almost exactly between Warsaw and Berlin, Poznań is naturally overshadowed by these two major central European capitals. Yet even when compared to other Polish tourist magnets such as Kraków, Wrocław or Gdansk, none of which significantly surpass Poznań either in terms of either size or attractions, Poznań remains unjustly overlooked by international travellers. Serving as Poland’s capital in the 13th century and the epicenter of the 1956 uprisings against Communist rule, there’s no lack of heritage and culture in the city, which has been swapped between Poland and the previously Prussian part of Germany several times in its torrid history. And while a constant change of citizenship rarely benefit a city’s well-being, it did bring Poznan some gifts twofold – including castles. Mainly for the reason that no classy ruler would go to bed with the enemy, rather less take its chambers. Most visitors, upon “discovering” Poznan, see it as the overlooked little beauty that it is: it brings a rich variety of cultural offerings to the table which, coupled with friendly locals who are not yet fed up with tourist crowds, is a recipe for a fantastic weekend break away. One great thing about the city’s main attractions is that they’ll spare you blisters. 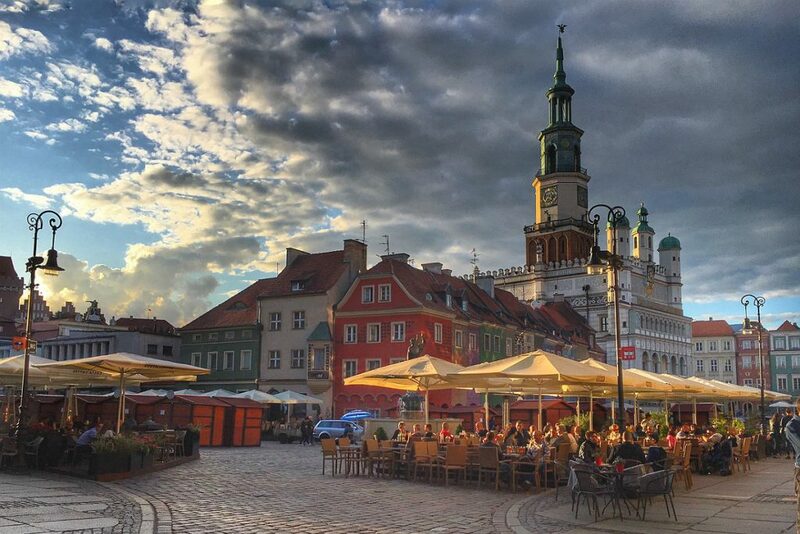 That’s not to say Poznan is short of classical sights worth mentioning, just that the city’s compactness allows you to cover a lot of them quickly, as most are within walking distance of the Stary Rynek, which is Polish for old market square. Right here you’ll immediately locate two of the city’s architectural pin ups. One of these is a neat row of Merchants’ Houses decked out in various hues, the other though will only show itself once a day at 12am, but don’t worry – dozens of spectators gathering around the beautiful Renaissance-era Town Hall will give you a heads up. 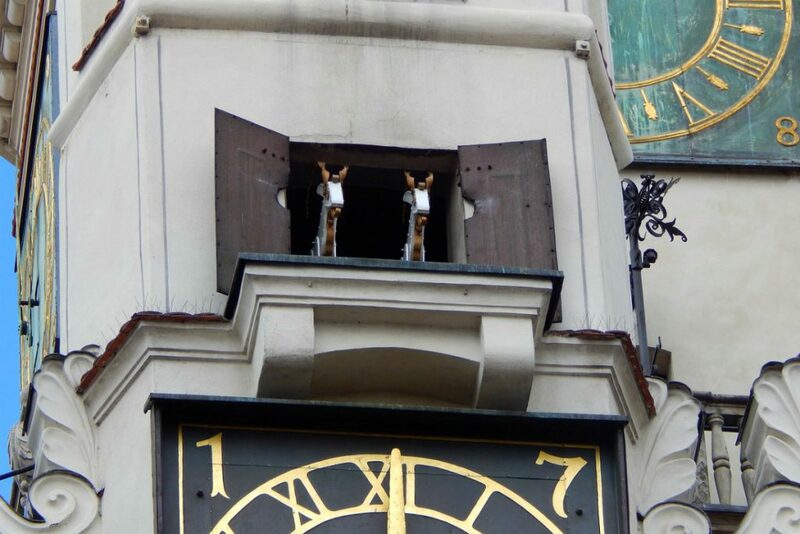 To be fair, the sight of two wooden goats leaving the building’s tower might prove to be a bit of a let-down considering the keen anticipation of the camera-wielding crowds. But it will at least leave you wondering where all those otherwise unnoticeable tourists suddenly sprang from. Of the two aforementioned fortresses, the recently reconstructed Royal Castle is just around the corner, while its German counterpart, the Imperial Castle not only comes with a roller-coaster history as bumpy as the city’s cobbles, but marks the starting point of a 10-15 minute stroll to the centre. Following this path, you’ll also pass by the monument of the 1956 uprising against the Communist rule, Adam-Mickiewicz-University and Plac Wolności. If you’ve still got more time on your hands and are up for a longer walk take a hike to Park Cytadela, not necessarily for the Poznań Army Museum, but for an impressive array of artistic sculptures and landscape architecture spread out over the 250 acres terrain. In any case you shouldn’t miss out on the water framed district of Ostrów Tumski, which is the oldest part of the city and harbours the Archcathedral Basilica of St. Peter and St. Paul, the state’s oldest cathedral. Once you’re done with the sights you might want to wander over to the recreational area of Lake Malta, where fun things to do include water sports, the zoo and hiring bikes. The lakeside really comes alive during June when the Malta Festival brings a wave of street theatre to its shores. To explore the districts of the Old Town and Ostrow Tumski, plus Srodka (see below) in more depth you might want to consider this private guided tour by Get Your Guide. From there you can actually just cross the Bishop Jordan Bridge at the futuristic Porta Posnania to get to Śródka district, a neat little neighbourhood in which hidden street art, local shops and coffee places leave their imprint on the cityscape. One of the nicest places here is the cafe La Ruina which, at the risk of spoiling any surprises, even comes with a cool retro, but heavily under-advertised cinema hall in the back. Don’t La Ruina the surprise…. 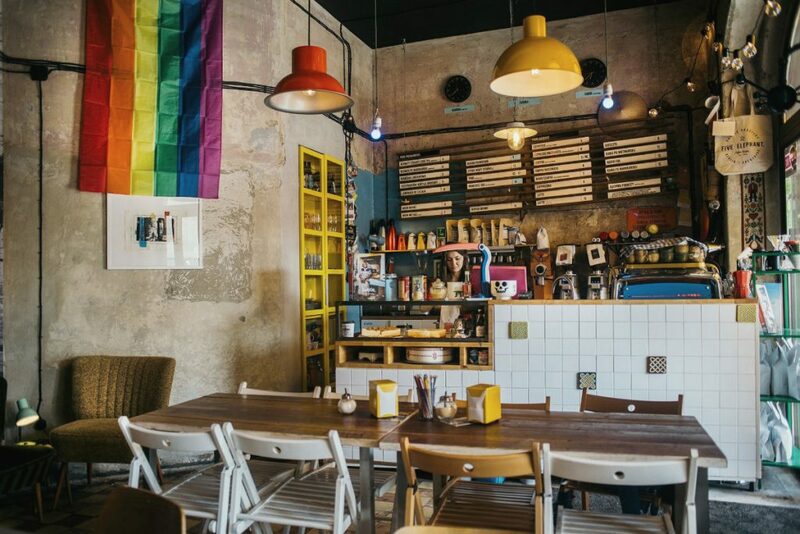 Śródka is far from a huge area but you’ll be able to spot other places of similar charm elsewhere in Poznan as recent developments in the new hipster capitals of Berlin and Warsaw have left their mark on their smaller neighbour as well. And although other wonderful comfort zones like the Taczaka 20 await you, why not go all the way and have a look at a local marketplace? Two of the most authentic are the food market at Rynek Jezycki and Otwarty Market, both right in the heart of Jeżyce, the artsy student district (also worth wondering around). Just make sure to brush up on your Polish numbers for bargaining with the market traders, or have Google Translate handy. Sure, we covered the hipster part already, but few places in Poznań would fit that category better than KontenerArt on the Warta riverbanks. 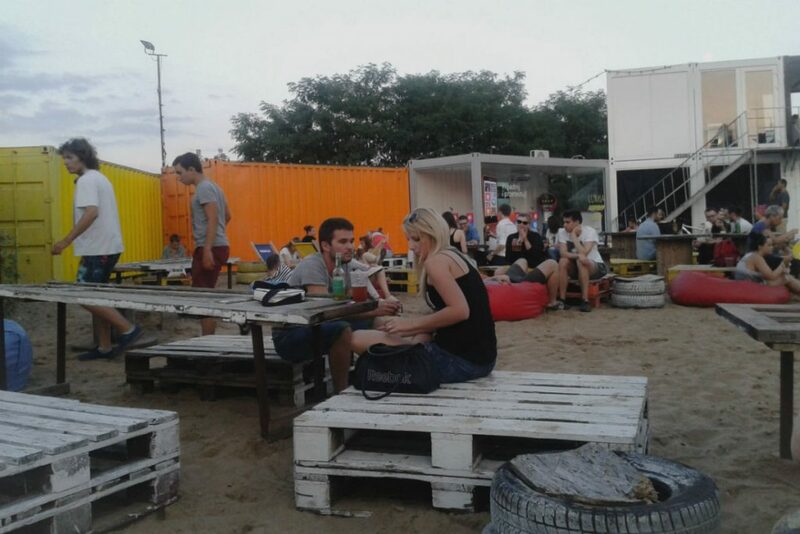 From May till October, people gather on this artificial beach, where old doors serve as tables, wooden pallets as seats and – the name sort of gives it away already – construction containers as common ground for art galleries, bars and late night parties. A touch of Berlin in Poland…. Even though the international film festival Transatlantyk sadly got moved to Lodź last year, the theater-themed Malta Festival at the end of June still turns Plac Wolności into a square thriving with cultural activity by day and a party stronghold at night. Out of the several smaller events Ethno Port, dedicated to world music and international art every summer, as well as the Ice Sculpture Festival in December, both deserve a visit. While locals, and Poles in general, are crazy about football, you might think twice before paying a visit to Stadion Miejski, home ground to the multiple-time national champions Lech Poznań – named after the alleged founder of Poland, just like the local beer brand. Not only do the local fans have a fearsome reputation, making attendance not without risk, but also the vagaries of the Polish ticketing system (you need to register as a fan of the club) makes it difficult for an outsider to attend matches. Still, it’s well worth trekking out to the new stadium rebuilt for the Euro 2012 tournament to admire a great white elephant (it’s 43,000 seats are rarely 50% filled). 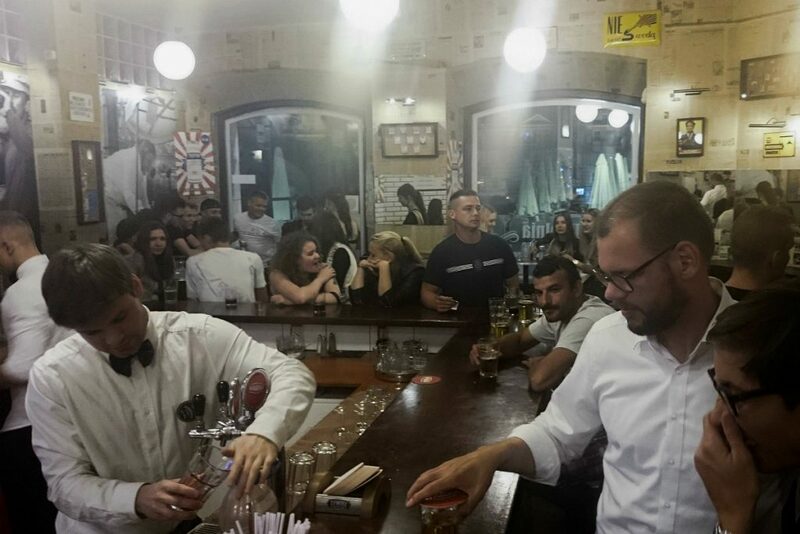 Bad news first: because of Poznan being relatively unknown, the chances of finding a hostel packed with sociable international backpackers are sometimes pretty slim. That being said, Very Berry Hostel also shines with other qualities: central location, homey interior and relatively empty dorms at a reasonable price. A bit more pricey than the typical Polish hostel, due to only having private rooms, is Sleep In Hostel & Apartments, which has a great industrial design. For those not being held back by any budget limitations, the internationally-inspired and individually designed rooms of the City Soleil Boutique Hotel is a fantastic choice, while the 5-star Blow Up Hall 50 50 is so artsy it actually has its own gallery inside its red bricked former brewery halls. For the best prices on almost every hotel in town, try Laterooms.com. Most Poles will probably agree that you haven’t really seen the country unless you’ve tasted its food. 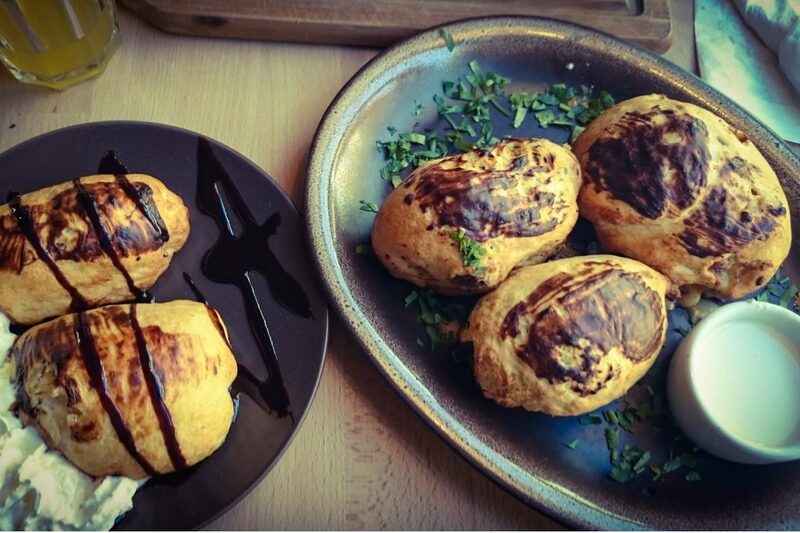 Pierogi are an essential rite of passage for any serious Poland trip and Pyszna Chatka serves up a veritable array of variations of these quintessentially Polish stuffed dumplings. For a taste of rural Poland head back to the Jezyce district where the rustic charm of Zagroda Bamberska and its homemade cuisine awaits. Whilst for an upmarket and modern twist on the nation’s gastronomy either Muga or Concordia Taste is a fine bet. Cacao Republika and the aforementioned La Ruina are equally pleasant little breakfast places. And if you’re just searching for something easy on the wallet, the Food Patrol Burger Truck opposite the Galeria MM shopping mall will provide you with a treat. The place’s popularity among locals might keep you waiting up to half an hour. The epicenter of Poznan’s nightlife is its old market Stary Rynek and its surroundings, where even blind men can locate a number of bars and clubs within seconds. Of those, Pijalnia Wódki i Piwa stands out. Noisy and notoriously overcrowded even in the early hours, many night-owls – more or less secretly – still end up here regularly. You might also drop by for a herring and a beer, if only for the sight of foreigners full-throatedly trying to do karaoke in Polish. Two corners further you’ll find Klub Dragon, probably my favourite place for a casual drink. If you squeeze your way through the cozy interior, either its windows or a passage through the toilets get you to the Dragon’s heart, a charming backyard. From there a stairway further leads up to a tiny restaurant and part-time concert venue, which might provide a laid-back jazz jam, an almost unattended experimental post-minimal washing-machine-beat-drumset-session, or anything in between. Apart from the clubs in the immediate proximity of Stary Rynek, where you should expect typical mainstream club music, with a wee bit more fondness for some rock hits past their prime than the typical western European city, Poznań also has a proper handful of more alternative clubs spread around the inner city. Most of those are dedicated to the slowly, yet steadily rising Polish electronic scene. Worth checking out are in particular LAS, SQ Klub and the successor of the minimalistic 8 bitow, Nowe Bity. Five kilometres west of the city lies Henryk Wieniawski Airport, which is served amongst others by Ryanair and WizzAir. There might be even cheaper alternatives though, if you happen to be from Central Europe yourself, as the convenient geographic location is a blessing. Trains or one of the several bus companies going from Berlin to Warsaw or vice-versa — Flixbus, Lux Express and Polskibus, all stop en route in Poznan. Other than these two obvious destinations, affordable direct trains also leave for any other popular national city spots such as Kraków, Wrocław, Gdansk, Lublin, Łódź and Szczecin. Ironically, of all websites the German railway company Bahn are the most reliable when it comes to live timetables for all intercity and regional connections. Due to an extreme shortage of blogs or websites that regularly focus on Poznań, the city’s official websites Poznan.pl and Poznan.travel are pretty much all you can go for. Of those, the latter proves to be much more visitor-tailored no matter what the reason for your trip might be. One great exception in the deserted Poznań foreign language-blogosphere is the Polish/English-bilingual PULSBLOG, which occasionally covers Warsaw as well but has plenty of insights on Poznań’s food, hidden treasures and city culture. 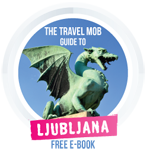 The Poland issue of Lonely Planet issue has a twelve page section on Poznań, but is hardly exhaustive. Since most of the better novels set in the city haven’t been translated into English, you might have better luck encountering familiar places by either reading a biography of one of the city’s more famous former residents like Paul von Hindenburg, or ingratiate yourself with the locals by finding a book about their contributions to cracking the Nazi Enigma code (there is a monument and museum in Poznan) or shooting down the Luftwaffe in the Battle of Britain. Being an overlooked city means that cineasts searching for international films featuring Poznań really have to do some digging. It is therefore rather ironic, that even in its arguably most notable movie appearance the city could have gotten much more exposure, had its producers just stayed completely true to the source material. The 1942 comedy To Be or Not to Be by Academy Award Winner Ernst Lubitsch about a bunch of theater actors in then Nazi-occupied Warsaw scheming and disguising in order to support the Polish Resistance is partly shot in Poznań’s opera, the Teatr Wielki. The Melchior Lengyl theater script the movie was based on however did not even take place in Warsaw, but Poznań. Continuing your adventures in Poland? This Central European country holds a special place in the heart of Urban Travel Blog and we’ve published dozens of Polish travel stories, so plenty to brush up on before you go. 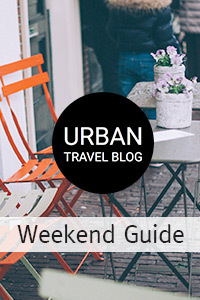 Or else check out all our European city guides right here. Feature photo by Beatrice BDM. I am from India, did my masters in Poland. during that time I enjoyed in Poznan it was my favorite place , I was in Poznan used to get on streets walks everyday. I traveled all around Poland enjoyed different tastes, Loved the country. During y stay in Poland I built a website http://www.msinpoland.com to help students to understand Poland better. A recent law graduate, Kai splits his time between Mannheim and Berlin, not far from the salty winds of the North Sea region where he grew up. A frequent traveller, ever since purchasing his first interrail pass in 2009, Kai's journeys have made him an expert on East and Central Europe.